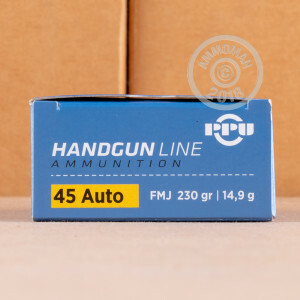 This dependable .45 ACP ammo from Prvi Partizan makes a solid range load for your 1911 or other .45 Auto pistol. 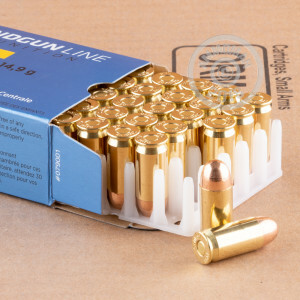 These cartridges come in boxes of 50 and fire a heavy 230 grain full metal jacket bullet at subsonic velocities. 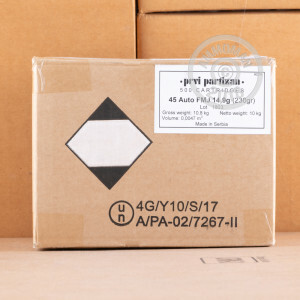 Prvi Partizan ammunition is made in Uzice, Serbia using non-corrosive Boxer primers and brass cases. Don't pay an arm and a leg for shipping. Shop at AmmoMan.com, where all orders over $99 ship for free!